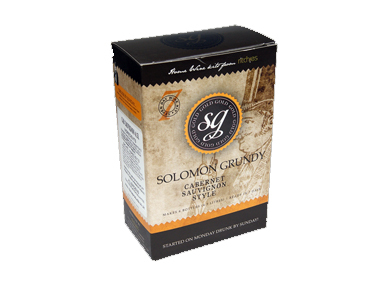 Order Solomon Grundy Cabernet Sauvignon Wine Kit 6 bottle from the Stirling Homebrew Shop UK. Buy Solomon Grundy Cabernet Sauvignon Wine Kit - 6 bottle and other Wine Kits safely online in the UK. This wine kit makes 6 bottles of homemade wine in just 7 days! Where to buy Solomon Grundy Cabernet Sauvignon Wine Kit 6 bottle safely online? Shop at the Stirling Homebrew Shop if you are wondering where you can buy Solomon Grundy Cabernet Sauvignon Wine Kit - 6 bottle safely online in the United Kingdom. Cabernet Sauvignon Wine Kit 6 bottle - Solomon Grundy Cabernet Sauvignon Wine Kit - 6 bottle in Wine Kits and Homebrew.